But finding that elusive ideal gift can be a monumental task. Particularly when you happen to be of the male side of the species. So, even after months of browsing the shops and following up on what were clearly obvious hints — you mean you didn’t want a new ironing board?? — sometimes these are the best words we can hope for. At least, what most guys can hope for. The thing is, if you happen to know where to look, it’s pretty easy to find that perfect gift; the special something that’s guaranteed to not only avoid the dreaded, empty “Thanks”, but will immediately spur that winning grin and transform you into the envy of all her friends. If that’s the sort of response you’re looking for this Christmas, you’ve come to the right place. Below is our Christmas gift guide for the women in your life, made up of a select group of unique gifts for three types of recipients: The Pampered Princess, The Master Cook, and The House Proud. What do you get the woman who has everything? The simple answer is, you don’t. Instead of aimlessly trying to dig out an ever more unusual gem, you make it so they can enjoy what they do have more. I think most women will agree this is best done through a bit of regular pampering. Devaiya aromatherapy oils are especially made for this purpose. The small Leeds-based company hand makes their products from a mix of natural oils that are specially chosen for their therapeutic benefits. Their Stresses Away Oil, for instance, is made from the perfect blend of natural oils to help clear the mind and relax the body. Their other blends include their Dream Away Oil, which helps you unwind and aids a restful nights sleep. Aches Away Oil, their best seller - this one, in particular, is an extremely versatile oil that can be used in a whole manner of ways to ease pain and soothe tension all over the body. I mean, what greater gift is there than helping someone to fully relax and enjoy the holidays? She already has every cooking gadget and gizmo, but, if she’s getting a present, she wouldn’t want anything other than something to assist her in her favourite activity. Whether that’s cooking, baking, or whipping up cocktails, the answer to this dilemma is a little thing called Spice Drops. Made by Holy Lama, a UK-based company born out of 1940’s India, Spice Drops replace all the faffing around with powders by condensing all the same flavour into a few little drops. Their baking collection, which contains spices like cinnamon, cardamom, and ginger, is ideal for adding a twist to deserts and Christmas puddings. While their cocktail spices collection, containing flavours like mint, rose, and lemongrass, is the perfect treat for an after dinner tipple. If you pick up all of their bestselling spice drops together, you also get a lovely handmade wooden spice rack to store them in. Everyone’s a winner. You can’t go wrong with buying something for the home. But there’s a big difference between not getting it wrong and getting it so, so right. The perfect gifts for the home tend to add not only aesthetic value, but also functionality and even bring pleasure too. Candles meet all three of these criteria; but the candles from Make Me Something Special go one step further by making it personal. Made from 100 percent natural ingredients and infused with essential oils, their large, personalised candles smell incredible and look the part too. After being hand poured into a traditional glass jar, they’re finished off with a solid wooden lid that can be personalised with engraved lettering. Merry Christmas? My heart burns for you? You can add whatever you like up to 40 characters. 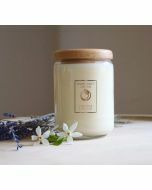 The candles come in two scents: sweet orange and geranium, known for its natural mood enhancing qualities; and lavender and neroli, a blend that encourages peace and tranquility. And if she loves candles so much she already has a boatload, then how about these elegant, goblet style candleholders. 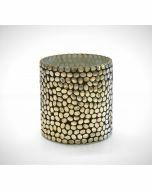 Perfect for pillar candles and creating a stylish and welcoming environment. Check out our full range of gifts for her and make sure this Christmas is one you’ll both remember for all the right reasons. Send Your Love On A Piece Of Art!